The sanguine bullish view is supported by Deutsche Bank (senior debt) Credit default swaps. Despite Friday’s morning’s 20 bps surge, CDS closed at 240 bps, still below trading highs from February. While elevated, these are not levels indicative of a looming Lehman-style collapse. Moreover, there’s the U.S. equities VIX index. Closing the week at 13.29, a level suggesting nothing but blue skies ahead. Moreover, the S&P ended Q3 only about 1% below record highs. The bears, well, they’re convinced the bulls are nuts. More important than whimsical CDS pricing, the naysayers point to an incipient exodus of Deutsche Bank clients. Global markets were shaken Thursday by a Bloomberg article discussing how some key hedge funds were abandoning ship. Not yet faded from memory, Lehman Brothers proved a prime brokerage and counter-party exposure nightmare. Those who panicked first panicked best. It’s perfectly rational for hedge funds in particular to shift assets, collateral and derivative business away from the slow-motion train wreck, Deutsche Bank. The bears see an approaching point of no return: a crisis of confidence and “run” on Deutsche that will necessitate a bailout and restructuring. I’ll take a somewhat different tack. Deutsche Bank is to the global government finance Bubble what Lehman was to the U.S. mortgage finance Bubble. Lehman may have been the catalyst, but the root of the problem was Trillions of mispriced securities, unsustainable home prices and deep structural impairment (financial and economic). Deutsche Bank is much larger today than Lehman was in 2008, and its tentacles are everywhere. The scope of the global government finance Bubble is multiples of the mortgage finance Bubble. Mispriced securities are in the tens of Trillions. Global structural impairment is unprecedented. There were lessons learned from 2008 – though most now work to bolster and prolong history’s greatest Bubble. Deutsche Bank is rather clearly in trouble. But it is unclear if a crisis of confidence is imminent. This institution desperately needs to raise capital. Transparency is lacking with regard to Deutsche Bank’s massive derivatives portfolio. Their investment banking, prime brokerage and derivatives businesses, already thin on profits, will suffer. But as Germany’s largest bank, it is not clear that as an institution it’s today as vulnerable to a run as Lehman was in 2008. Rumor of a Department of Justice settlement saw Deutsche Bank shares rally 10% intraday to close Friday’s session up 14%. Italian stocks rallied 6% intraday. European stocks recovered 4.5%. Even with Friday’s gains, it was another rough week for global financial stocks. Notably, Japan’s TOPIX Bank index sank 7.5%, increasing 2016 losses to 30%. Hong Kong’s Hang Seng Financials dropped 2.7%. Italian stocks declined another 1.7% this week, taking its y-t-d decline to 50%. Europe’s STOXX 600 Bank index declined 1.0%, increasing 2016 losses to 23%. The wild volatility in financial shares is reminiscent of 2008. Deutsche Bank is a potential catalyst for the bursting of the global Bubble. It has company. Though it is almost unique as a poster child of the mess global policymaking has made of things. After the 2008 crisis, Deutsche Bank had the opportunity to take market share in global prime brokerage, derivatives and investment banking – and couldn’t resist. As a German institution, it benefitted from European economic and banking system fragility. Not surprisingly, all the abundant cheap finance ensured the bank found myriad avenues to get itself into trouble. And then the Draghi ECB, along with global central bankers, lost their minds, with massive QE and negative rates inciting dislocation throughout the massive global bond and derivatives markets. Deutsche Bank exemplifies the fragility of the global financial system. And this vulnerability is associated directly with egregious monetary stimulus – past and present. Trouble at Deutsche Bank comes at an inopportune for the unsound European banking system. It comes at a tough time for Merkel, the Bundesbank and the German government more generally. The political backdrop makes it difficult for the German government to support its largest bank. A faltering Deutsche Bank will only toughen German public enmity toward ECB policymaking. 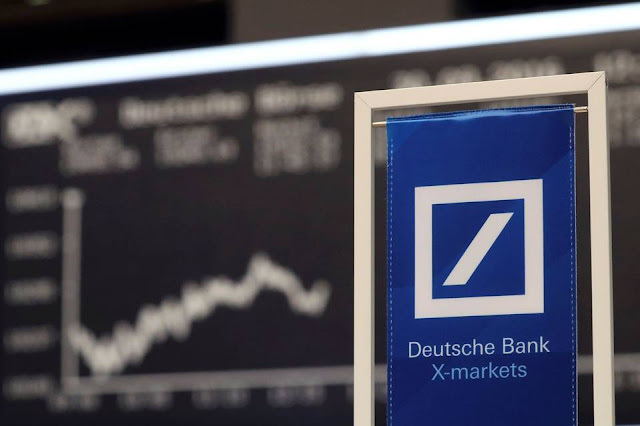 To be sure, Deutsche Bank is illuminating the serious predicament associated these days with being a highly leveraged financial institution in a world of acute monetary disorder and price instability. They are certainly not alone. Sinking global bank stocks provide another important crack in global confidence – confidence in finance and confidence in policymaking. Importantly, the Deutsche Bank imbroglio comes as faith in central banking is waning. It comes with geopolitical tensions running high. The VIX is about 13. Meanwhile, the costs of all types of market derivative insurance are rising – especially in currency swaps markets. Deutsche Bank will have little option than to back away from derivatives market-making activities. This comes at the expense of already susceptible marketplace liquidity, ensuring heightened caution from other major derivatives players. The cost of market insurance is on the rise, with negative ramifications for risk-taking and market liquidity more generally. While convenient, don’t blame it all on Deutsche Bank. It’s becoming increasingly systemic. Sometimes history jumps. Think of the first world war, the Bolshevik revolution, the Great Depression, the election of Adolf Hitler, the second world war, the beginning of the cold war, the collapse of the European empires, Deng Xiaoping’s “reform and opening up” of China, the demise of the Soviet Union, and the financial crisis of 2007-09 and subsequent “great recession”. We may be on the brink of an event as transformative as many of these: the election of Donald Trump as US president. This would mark the end of a US-led west as the central force in global affairs. The result would not be a new order. It would be perilous disorder. The fact that Mr Trump can be a credible contender for the presidency is astounding. In business, he is a serial defaulter and litigator turned reality TV star. He is a peddler of falsehoods and conspiracy theories. He utters racist calumnies. He attacks the independence of the judiciary. He refuses to reveal his taxes. He has no experience of political office, and incoherent policies. He glories in ignorance. He even hints at a federal default. He undermines confidence in the US-created trade order, by threatening to tear up past agreements. He undermines confidence in US democracy by claiming the election will be rigged. He supports torture and the deliberate killing of the families of alleged terrorists. He admires the former KGB agent who runs Russia. Evidently, a huge number of US voters have lost confidence in the country’s political and economic systems. This is so to an extent not seen even in the 1930s, when voters turned towards an established politician. Yet, for all its challenges, the US is not in such terrible shape. It is the richest large country in the history of the world. Growth is slow, but unemployment is low. If voters were to choose Mr Trump — despite his failings, displayed again in the first presidential debate — this would tell us grim things about the health of the US. It is the world’s leading power, so this is not just a domestic US concern. What might a Trump presidency mean? Forecasting the policies of someone so unpredictable is impossible. But a few things seem at least reasonably clear. The US and its allies remain immensely powerful. But their economic dominance is in slow decline. According to the International Monetary Fund, the share of the high-income countries (essentially, the US and its chief allies) will fall from 64 per cent of global output (measured at purchasing power) in 1990 to 39 per cent in 2020, while the US share will fall from 22 per cent to 15 per cent over this period. While the US military might is still huge, two caveats must be made. 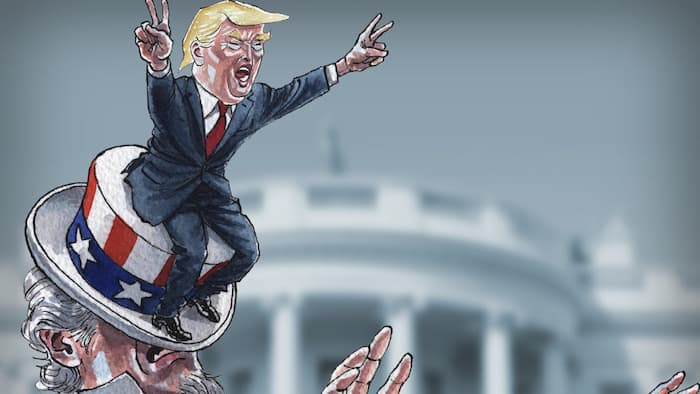 One is that winning a conventional war is quite a different matter from achieving one’s aims on the ground, as the Viet­nam and Iraq wars showed. Furthermore, China’s rapidly rising defence spending could create serious military difficulties for the US in the Asia-Pacific region. It follows that the ability of the US to shape the world to its liking will rest increasingly on its influence over the global economic and political systems. Indeed, this is not new. It has been a feature of US hegemony since the 1940s. But this is even more important today. The alliances the US creates, the institutions it supports and the prestige it possesses are truly invaluable assets. All such strategic assets would be in grave peril if Mr Trump were to be president. The biggest contrast between the US and China is that the former has so many powerful allies. Even Vladimir Putin is not a reliable ally for China. America’s allies support the US largely because they trust it. That trust is based on its perceived commitment to predictable, values-based behaviour. Its alliances have not been problem-free, far from it. But they have worked. Mr Trump’s cherished unpredictability and transactional approach to partnerships would damage the alliances irreparably. A vital feature of the US-led global order has been the role of multilateral institutions, such as the IMF, the World Bank and the World Trade Organisation. In binding itself by the rules of an open economic system, the US has encouraged others to do the same. The result has been extraordinary growth in prosperity: between 1950 and 2015, average global real output per head rose sixfold. Mr Trump does not understand this system. The results of repudiation could be calamitous for all. The Iraq war has damaged trust in US wisdom and competence. But the global financial crisis has been even more destructive. Many have long suspected US motives. But they thought it knew how to manage a capitalist system. The crisis devastated that confidence. After all this damage, election of a man as unqualified as Mr Trump would call into question something even more fundamental: belief in the capacity of the US to choose reasonably well-informed and competent leaders. Under a President Trump, the democratic system would lose much of its credibility as a model for the organisation of a civilised political life. Mr Putin and other actual or would-be despots would cheer. Their belief that talk of western values is just hypocrisy would be vindicated. But those who see the US as a bastion of democracy would despair. If Mr Trump were to win, it would be a regime change for the world. It would, for example, end efforts to manage the threat of climate change, possibly forever. But even his candidacy suggests that the US role in the global order risks undergoing a transformation. That role depended not only on American economic and military prowess, but also on the values it represented. For all its mistakes, the ideal of a law-governed democratic republic remained visible. Hillary Clinton is an imperfect candidate. Mr Trump is something else altogether. Far from making America great, his presidency might unravel the world. An increasing array of unpredictable global challenges requires reshaping the global body to confront them. As we pass the 70th anniversary of the founding of the United Nations, and approach the appointment of the next U.N. secretary-general for the decade ahead, we need to consider afresh the institution’s future, its relevance to the global challenges of our time, and what changes are necessary to ensure its long-term future. First, the U.N. matters. In fact, because it is such an embedded part of the postwar order, it matters a lot. So much so that if it were to fail, falter, or just fade away, this would further erode the stability of an already fragile global order. Our current order faces new, mounting, and compounding challenges unlike any we have seen in a quarter of a century. Along with a rapid deterioration in U.S.-Russia and U.S.-China relations (accompanied by a new strategic rapprochement between Moscow and Beijing), we face a humanitarian refugee crisis, an ongoing war in Syria and Ukraine, and a range of growing security challenges across East Asia. There have been even more profound transformations in global geoeconomics, where China is now the world’s second-largest economy and, despite recent slower growth, is soon to become the largest — supplanting the United States after more than 150 years of global economic dominance. In the meantime, Europe’s economy has yet to emerge from a decade of stagnation and where European politics, both regionally and nationally, represent a continuing drag on a robust future. Beyond these emerging global fault lines threatening traditional patterns of stability, we are also seeing the rise of a new generation of lethal nonstate actors, principally in the form of violent jihadism, who reject the state-based system, actively seek to destroy it, and operate entirely outside the already flimsy fabric of international law. To add to the new complexities facing the current global order, we are also witnessing another wave of challenges generated by accelerating and increasingly unpredictable dynamics of globalization. On the one hand, this is generating new demands for more effective global governance to deal with “the globalization of everything.” At the same time, globalization is also unleashing dangerous new political, economic, and social counterforces from those that are not benefiting from the globalization project of the last quarter of a century, manifesting as a potent cocktail of nationalism, protectionism, and xenophobia. These forces, in turn, are beginning to threaten the fabric of the current order in new ways, and at multiple levels, as conflicting constituencies simultaneously demand of their governments both more and less globalization. Taken together, we seem to be approaching a new global tipping point that departs from the comfortable assumptions of recent decades that the dynamics of greater global integration were somehow both benign and unstoppable. So when we are seeing the emergence of new forces that threaten to pull the world apart, the very institutions the international community established to bring the world together through cooperative forms of global governance should be more important than ever. Yet the uncomfortable truth is that these institutions have never been weaker. We see this with the World Trade Organization, which has struggled unsuccessfully for more than a decade to bring about a new trade round; the International Monetary Fund, which despite its charter could not handle the global financial crisis and had to yield to the creation of a new, nonmultilateral institution (the G-20) as the premium organization of global financial economic governance; and the U.N. itself, where institutions are rarely empowered by member states to deal effectively with major global challenges. After 70 years, the U.N. has become so “factored in” to the international order that we are barely conscious of the stabilizing role it plays in setting broad parameters for the conduct of international relations. We tend to take the U.N. for granted. We see it as a comfortable part of the international furniture. We tend to take the U.N. for granted. We see it as a comfortable part of the international furniture. A permanent fixture — a given. But as history reminds us, nothing is forever, least of all the durability of global institutions, whose history is recent and whose precedents are fraught. Nor is history necessarily linear; we are not somehow destined to enjoy increasingly progressive forms of global governance. Regression is equally possible. And if the U.N. one day disappears — or, more likely, just slides into neglect — only then would we become fully aware of the gaping hole this would leave in what would remain of the postwar order. Without the U.N., we would be left with increasingly brittle state-on-state relationships, with little remaining to mediate, negotiate, or resolve interstate crises when they arise. While the U.N. today is not broken, it is in trouble. Many fear it is starting to drift into irrelevance as states increasingly avoid the U.N. on the most important questions facing the international community, seeking substantive solutions elsewhere. Many are concerned that the U.N. is being overwhelmed by the major systemic changes and challenges now buffeting the global order. The U.N. has a 20th-century institutional structure and culture that is struggling to adapt to these new 21st-century realities. And if it fails to adapt, the U.N. will slowly slide into the shadowlands. But this drift into irrelevance need not be the case. From its history, we know the U.N. is capable of reinventing itself. Past decades have seen Security Council reform and the creation of the U.N. Framework Convention on Climate Change as well as U.N. Women. There is no point dreaming that the U.N. can be rebuilt from the ground up. But we can intelligently re-examine its functions, structure, and allocation of resources to make it better equipped to meet the challenges of the future. To that end, we need a U.N. whose inherent legitimacy and universality are reaffirmed by a formal political recommitment to the fundamental principles of multilateralism by member states. We need a U.N. that structurally integrates its peace and security, sustainable development, and human rights agendas as a strategic continuum, rather than leaving them as the self-contained, institutional silos of the past. We need a U.N. that helps build bridges between the great powers, particularly at a time of rising great-power tensions. We need a U.N. with a robust policy-planning capability, looking into the future several years out, not just at the crises of the day. We need a U.N. that embraces a comprehensive doctrine of prevention, rather than just reaction, that is directly reflected in the organization’s leadership structure, culture, and resources. We need a U.N. in the field that finally resolves the problem of its rigid institutional silos by moving increasingly to integrated, multidisciplinary teams to deal with specific challenges. We need a U.N. driven by the measurement of results, not just the elegance of its processes. We need a U.N. where women are at the center of the totality of its agenda, not just parts of it, so that their full human potential can be realized as a matter of social justice, and because to fail to do so would further undermine peace, security, development, and human rights. We need a U.N. where young people have their voices heard at the center of the U.N.’s councils, not simply as a paternalistic afterthought, to help shape a future of genuine hope for the more than 3 billion people today under 25 years old. We need a U.N. that is relevant to the new, emerging, critical global policy agendas of the future, not just those of the past, including effectively countering terrorism and violent extremism, enhancing cybersecurity, constraining lethal autonomous weapons systems, dealing with the inadequate enforcement of international humanitarian law for the wars of the future, and developing a comprehensive approach to planetary boundaries beyond climate change, particularly for our oceans. We need a U.N. that can efficiently, effectively, and flexibly act within the reality imposed by ongoing budgetary constraints, rather than just hoping that the fiscal heavens will one day magically reopen, because they won’t. This is, admittedly, a long list of asks. But any less won’t do. There is no such thing as “one-off” reform. For the U.N. to have a robust future in delivering results that are directly relevant to the challenges of the international community, we must actively engage in a process of continually reinventing the institution. There is an argument that the institutions of international relations inherently tend toward entropy — that the processes of long-term decay begin at the day of founding. Perhaps it’s true that all things must ultimately die, but we can certainly act to prolong the life span. The medicine that is necessary is a conscious, continuing program of active reinvention — to remind the institution of its core and continuing values, to refresh its institutional culture, and, where necessary, to reprogram some of its functions. When the peoples of the world see growing disagreement among the great powers, the re-emergence of old interstate tensions and conflicts, terrorists on their streets, chaos in their markets, and jobs disappearing with nothing to replace them, they are increasingly asking: “Is anybody in control anymore?” This is not an unreasonable question. So what can be done? How can we breathe new life into an old institution so that the U.N. can perform its central role of preserving a peaceful and just global order? Can we begin to imagine a U.N. for the 21st century that responds to a growing demand for effective global governance in an age of ever-diminishing supply, and when the governance “deficit” seems to be widening? I hope this report, and its 50-plus specific recommendations on top of the generic principles listed above, is a modest beginning. There is a rational basis for optimism about the U.N.’s future. But overcoming inertia requires effort. Nor should we succumb to a type of fashionable pessimism that substantive change is too hard. The truth is that while the challenges the U.N. faces are real, the answers really do lie within our grasp — if we can deploy the collective political will to make change happen. SAN FRANCISCO – Over the last 30 years, consumers have reaped the benefits of dramatic technological advances. In many countries, most people now have in their pockets a personal computer more powerful than the mainframes of the 1980s. The Atari 800XL computer that I developed games on when I was in high school was powered by a microprocessor with 3,500 transistors; the computer running on my iPhone today has two billion transistors. Back then, a gigabyte of storage cost $100,000 and was the size of a refrigerator; today it’s basically free and is measured in millimeters. Even with these massive gains, we can expect still faster progress as the entire planet – people and things – becomes connected. Already, five billion people have access to a mobile device, and more than three billion people can access the Internet. In the coming years, 50 billion things – from light bulbs to refrigerators, roads, clothing, and more – will be connected to the Internet as well. Every generation or so, emerging technologies converge, and something revolutionary occurs. For example, a maturing Internet, affordable bandwidth and file-compression, and Apple’s iconic iPhone enabled companies such as Uber, Airbnb, YouTube, Facebook, and Twitter to redefine the mobile-customer experience. Now we are on the cusp of another major convergence: big data, machine learning, and increased computing power will soon make artificial intelligence, or AI, ubiquitous. AI follows Albert Einstein’s dictum that genius renders simplicity from complexity. So, as the world itself becomes more complex, AI will become the defining technology of the twenty-first century, just as the microprocessor was in the twentieth century. Consumers already encounter AI on a daily basis. Google uses machine learning to autocomplete search queries and often accurately predicts what someone is looking for. Facebook and Amazon use predictive algorithms to make recommendations based on a user’s reading or purchasing history. AI is the central component in self-driving cars – which can now avoid collisions and traffic congestion – and in game-playing systems like Google DeepMind’s AlphaGo, a computer that beat South Korean Go master Lee Sedol in a five-game match earlier this year. Given AI’s wide applications, all companies today face an imperative to integrate it into their products and services; otherwise, they will not be able to compete with companies that are using data-collection networks to improve customer experiences and inform business decisions. The next generation of consumers will have grown up with digital technologies and will expect companies to anticipate their needs and provide instant, personalized responses to any query. So far, AI has been too costly or complex for many businesses to make optimal use of it. It can be difficult to integrate into a business’s existing operations, and historically it has required highly skilled data scientists. As a result, many businesses still make important decisions based on instinct instead of information. This will change in the next few years, as AI becomes more pervasive, potentially making every company and every employee smarter, faster, and more productive. Machine learning algorithms can analyze billions of signals to route customer service calls automatically to the most appropriate agent or determine which customers are most likely to purchase a particular product. And AI’s applications extend beyond online retail: Brick-and-mortar stores still account for 90% of retail sales, according to the consultancy A.T. Kearney. Soon, when customers enter a physical store, they will be greeted by interactive chat-bots that can recommend products based on shopping history, offer special discounts, and handle customer-service issues. Advances in so-called “deep learning,” a branch of AI modeled after the brain’s neural network, could enable intelligent digital assistants to help plan vacations with the acumen of a human assistant, or determine consumer sentiments toward a particular brand, based on millions of signals from social networks and other data sources. In health care, deep-learning algorithms could help doctors identify cancer-cell types or intracranial abnormalities from anywhere in the world in real time. To deploy AI effectively, companies will need to keep privacy and security in mind. Because AI is fueled by data, the more data the machine gains about an individual, the better it can predict their needs and act on their behalf. But, of course, that massive flow of personal data could be appropriated in ways that breach trust. Companies will have to be transparent about how they use people’s personal data. AI can also detect and defend against digital security breaches, and will play a critical role in protecting user privacy and building trust. As in past periods of economic transformation, AI will unleash new levels of productivity, augment our personal and professional lives, and pose existential questions about the age-old relationship between man and machine. It will disrupt industries and dislocate workers as it automates more tasks. But just as the Internet did 20 years ago, AI will also improve existing jobs and spawn new ones. We should expect this and adapt accordingly by providing training for the jobs of tomorrow, as well as safety nets for those who fall behind. AI is still a long way from surpassing human intelligence. It has been 60 years since John McCarthy, a computer scientist and nominal father of AI, first introduced the term during a conference at Dartmouth College, and computers have only recently been able to detect cats in YouTube videos or determine the best route to the airport. We can count on technological innovation to continue at an even more rapid pace than in previous generations. AI will become like electrical current – invisible and augmenting almost every part of our lives. Thirty years from now, we will wonder how we ever got along without our seemingly telepathic digital assistants, just as today it’s already hard to imagine going more than a few minutes without checking the 1980s mainframe in one’s pocket. Led by the Organization for Economic Cooperation and Development, the initiative is called “Base Erosion and Profit Shifting,” or BEPS, after the kind of corporate-tax practice it seeks to subdue. Progress isn’t as far advanced as it is on the OECD’s parallel project to clamp down on private-banking tax havens, but it is already showing signs of chivying companies into action. A set of principles was published last October to which 85 countries have signed up, including all major economies. The OECD is now working on the cumbersome process of implementing the rules. One tangible example: Roughly 50 governments so far have introduced country-by-country reporting, forcing companies to supply tax authorities with national breakdowns of sales, profits, taxes, employees and assets. Most reports won’t be public, but they will be shared among participating tax authorities, making it easier to spot dubious practices. The U.S. Treasury issued rules that force all U.S. multinationals with revenues above $850 million to file country-by-country returns for financial years starting after June 30. Some haven’t waited for deadlines. Amazon last year started booking sales through individual European countries rather than through low-tax Luxembourg. In January, Alphabet’s Google, which used to funnel European sales through Ireland and profits through Bermuda, cited BEPS in a £130 million settlement with the U.K. tax authority that involved a pledge to pay more tax in the country. Others, from auction house Sotheby’s BID -0.03 % to private-equity group Blackstone, have warned investors in annual reports that higher taxes could hit future earnings. BEPS wants to ensure profits are taxed “where economic activities are carried out and value is created.” The difficulty of pinning down what creates value, particularly for tech companies with few physical assets, suggests corporate taxation will remain controversial even if the use of Caribbean tax havens is stamped out. To the chagrin of some European governments, there was no international consensus in favor of a special taxation regime for the tech sector. 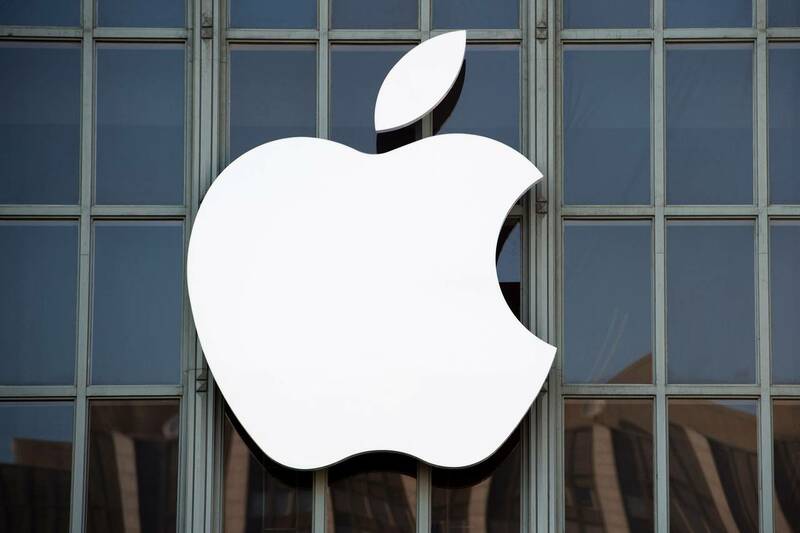 Still, BEPS looks set to change corporate behavior in a way the European Commission’s legal battle with Apple over a now-defunct tax arrangement cannot. Deutsche Bank stock has endured such stomach-lurching drops this week that some have questioned its survival, or talked of the need for a government bailout. Such talk is unrealistic, even wild. Here are the numbers that will show you why. Deutsche’s balance sheet has changed a lot since 2008 when it was one of the most highly leveraged banks in the world. The simplest way to see this is simply to look at assets and equity. At the end of 2008, Deutsche’s total assets as measured by international accounting standards were 69 times as large as its total equity. Now, that leverage multiple has been slashed to 27 times—meaning it has more than twice the equity per euro of assets on its balance sheet than it did back in 2008. Losses are less harmful because its balance sheet has more support. But what really matters today is regulatory capital, which is calculated in relation to risk-weighted assets—a measure of the loans and bonds it owns adjusted by a kind of complicated credit-scoring system. The rules around how this works have changed so much since 2008 that today’s capital ratios aren’t comparable. But it is useful to look at just how much equity Deutsche would have to burn through in order for its situation to become truly dire. On the strictest view of its capital base, which is to only count the equity that qualifies when all postcrisis changes come fully into force in 2019, Deutsche had €43.5 billion ($48.82 billion) of common equity tier 1 capital at the half year. That gives it a capital ratio of 10.8%. By 2019 that needs to get to 12.25%. If a bank gets into real trouble, one of the first things that happens is that a set of junior bonds, known as Cocos, get converted into fresh equity. This typically would happen if the bank’s capital ratio drops to 7%. For Deutsche, that would mean losing more than €15 billion of equity. The fear swirling around Deutsche was sparked by news that U.S. prosecutors had made an initial proposal that it pay $14 billion to settle mortgage-bond probes. But the bank already has put aside €5.5 billion of reserves for settling lawsuits. To drop to that 7% capital ratio trigger point, the mortgage settlement and other losses would have to amount to almost €21 billion. Actually, the loss would have to be bigger than that because Deutsche would first also not pay any bonuses to its bankers (or pay them in stock or other instruments). In 2015, total variable pay was worth €2.5 billion. That would be a huge amount of money to lose very suddenly just to reach the first major line of defense. Deutsche’s real problems are longer term with its costs, its profitability and the capital hurdle it must clear by 2019. That isn’t helped by reports of hedge funds taking their business elsewhere. This will cut revenues further, which as J.P. Morgan analysts point out could force the bank to seek fresh equity soon. Perceptions that the bank is high risk aren’t going to lead to a government bailout, but they will make it ever harder for Deutsche to repair its profitability and build the extra capital it still needs.